We'd taken the food to go, but when Roger struggled to take a bite of his burger while pulling out of the parking lot, it became clear that this was an eat, then drive situation, and he'd pulled back into the parking lot. I hadn't realized until Roger told me, after we'd ordered, that In-N-Out was a West Coast-only burger chain. There was no In-N-Out in Connecticut, because clearly that state was an inhospitable wasteland. As soon as Roger steered the car toward Kansas, the landscape began to look much more Kansas-like, even though we were still in Colorado. Soon the mountains were gone, and everything was flatter, dry-looking, straw colored - and we had our big open skies back again. As expected, the land was very, very flat. But it was an expansiveness, a peacefulness to it, and I propped my feet on the dashboard, leaned my head back against the headrest, and just took in the scenery. "I just . . . " I looked up at the sky for a moment, then pressed on. "I thought I was going to die," I said. "For one really long second during the accident, I thought it was all over. And then, obviously, I didn't, but . . . it was like I went the opposite way. Like I stopped living entirely, so I wouldn't have to feel anything again. Because feeling had led to it hurting so, so much . . . " My voice caught again, but I took a breath and continued saying these things I hadn't even realized until a second ago that I felt. "But since I've been out here, on this trip . . . it's like I've started to remember what it's like. To feel alive. To feel anything. And all I'm saying is that you never know how much time you have." And as we slowed for just a breath, to a kiss that was sweeter and more lingering, I understood in a flash why, on the Greyhound sign, Arrivals and Departures were right next to each other. Because sometimes, like in that moment, they can mean exactly the same thing. It took me a while to get through Amy & Roger's Epic Detour (a little over a week, according to Goodreads), but that wasn't because I didn't enjoy the book - that week just seemed to be extra busy and things got in the way. 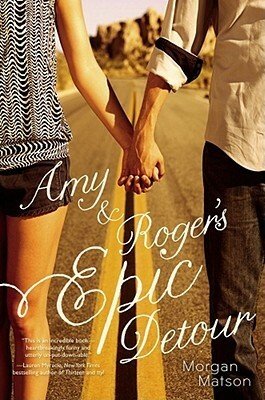 Amy & Roger's Epic Detour is simple, well, epic. Upon finishing it, I can easily consider it one of my favorite reads of 2015. Amy's mother has planned a cross-country road trip for her and Roger (who will be spending the summer with is father in Pennyslvania) and has everything, including hotel bookings, meticulously planned. Of course, within minutes of meeting Roger and Amy decide to divert from her mother's itinerary. With Amy as navigator, the two set off on a road trip that, unbeknownst to them, will change their lives and give them both the closure they so desperately need. I immediately liked both Amy and Roger. Something about their characters drags you in and holds tight. Whether it's Roger's perpetually upbeat attitude or Amy's struggle with the recent death of her father, you instantly care for both of them. Which is a good thing since you spend 90% of the story with just these two. The amount of character growth is astounding - particularly in Amy. She starts off sort of shell-like, not that you can blame her, and through her adventures with Roger slowly becomes mentally and emotionally stronger. Roger doesn't go through a huge character growth, but through his trip with Amy he is able to find some answers he's been longing for and a sort of inner strength of his own. The relationship between these two is wonderfully done. They'd been friend's as children, but due to one thing or another (despite their mothers keeping in touch), they haven't seen each other in years. There aren't too many awkward instances in the beginning, but nor is there any sexual tension. And while I love me some good sexual tension, it felt like a huge breath of fresh air to read a story where the characters aren't immediately dying to make out with another. There aren't any longing glances or lingering hands. Pure and simple, they're friends with a relationship the grows in, what can only be defined as, a realistic fashion. Amy & Roger's Epic Detour is a story with characters that you both want more of and to leave it alone. It feels as if anything (aside from a cameo here and there in Morgan's other novels), would taint this beautiful story. The narration is amazing and Morgan does a wonderful job of getting readers in Amy's head and enraptured in the story. Even the minorist of minor characters standout and move both the story and character development along in wonderful ways. This is an emotional story full of laughter, tears, romance, and growth. I found myself crying during specific scenes (and I wish I could touch on them in detail, but that would be too much of a spoiler), quickly followed by some of the biggest grins I'm sure I've ever broken out in. Morgan is a hugely talented writer who constantly hits you right in the gut with the widest range of emotions I've even gone through in one book. An absolute must read.